I’m a vegan. I love vegan food. I like some vegan people. But most people don’t.Some vegans are ruining veganism for the rest of the human population. It’s time to take a stand and stop the madness! Ever heard the joke, “How do you find a vegan at a dinner party? Don’t worry they’ll tell you”? WE NEED TO STOP LIVING UP TO THIS STEREOTYPE. I only bring up veganism with people if I need to reject food they’ve offered me that looks delicious but isn’t vegan, or if people ask me about it. The people who want to know about it will ask, trust. Falls under the umbrella of #1, but if you can’t resist talking about your veganism, please please please don’t be preachy. You probably wouldn’t want one of your friends to try to convert you to a new religion. You CERTAINLY wouldn’t want them to try to convert you to paleo, Atkins, etc. Preaching is not the way to win them over. Even the most compelling statistics that you grabbed from the PETA website won’t convince anyone that isn’t already interested in veganism. Giving them delicious vegan baked goods is a much better strategy. 3. Accept the cold, hard, truth: some people can’t be vegan, and that’s okay. 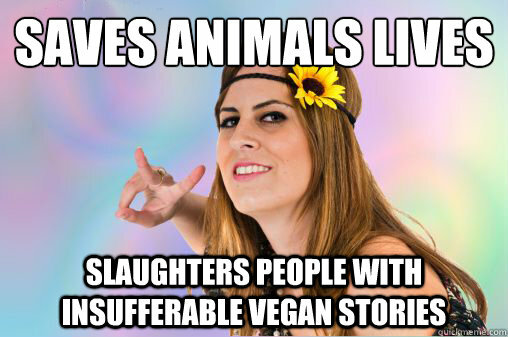 It’s pointless getting frustrated with the fact that not everyone you know is vegan. Being a vegan is awesome and great for the planet, etc., but it’s just not doable for most people in 2013. Even if your soy curls taste JUST LIKE chicken or your cashew-based alfredo is better than anything pushed out of a cow’s udder. It’s okay. Their time will come. Don’t push it. 4. Beyoncé isn’t vegan. Clearly, vegans aren’t better than everyone. Stop acting like you are. Just because vegans, as a group, eat more kale and tofu and whole grains (and Oreos) and care about animals and the environment doesn’t mean that we are better people than non-vegans. It just doesn’t. This would probably be solved by following 1-4. Just in case you’re ignoring those, though, remember that it’s not worth arguing about veganism with the dude behind the counter at the butcher or your bro-y classmate who would wear a meat dress to school if given the option. It’s not worth your time AND you will give vegans a bad rap. Never wear this dress. It’s a disgrace.